The Rhythm Guitar has been dubbed complicated and emotionless by some of its critics. A company has invented a stringless guitar, and it's fair to say its getting a pretty mixed reaction. Magic Instruments' Rhythm Guitar enables users to play chords at the push of a button in a way that's reminiscent of Guitar Hero. 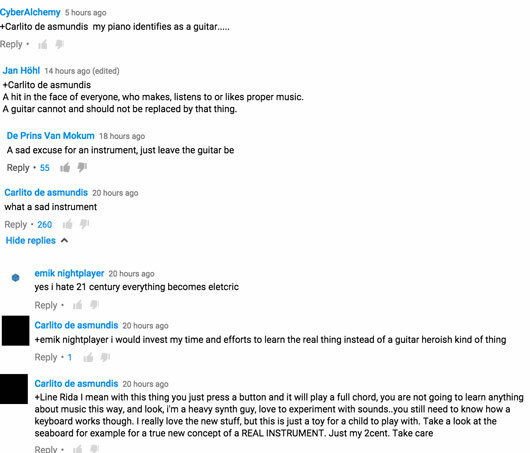 However, it turns out - just like the real guitar - you'll still have to learn how to use it first. The "instrument" was given a lukewarm review by The Verge's Jacob Kastrenakes, who dubbed it "a really complicated way to not learn guitar," and it's prompted passionate debate ever since. The comments below the video are a lot less measured than The Verge however, with guitar purists calling the invention a "toy" and a "sad excuse for an instrument" and others citing likes of Frank Zappa in its defence. However, some have spoken out in defence of the new creation, with YouTube user, Line Rida, even comparing it to when guitars went electric. He makes a good point, but is it more guitar villain than Guitar Hero?